Precut tabs feature white inserts that can be typed, handwritten, laser or inkjet printed. Self-adhesive tabs stick permanently to your pages to help you swiftly find your place again and again. Make sure you swin easily through a sea of data. Organize your work and make specific pages easier to find. 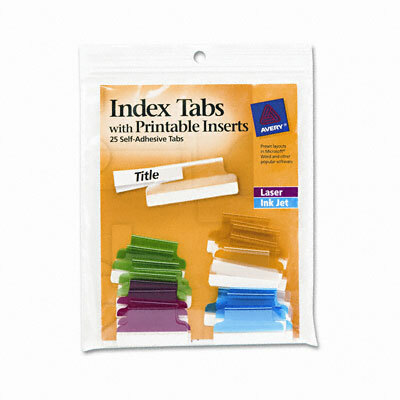 Precut tabs feature white inserts that can be typed, handwritten, laser or inkjet printed. Tab pages for handy referenc later. Easy to use with free Avery® templates and software. 1/3" tab extension. Permanent adhesive sticks securely to help you swiftly find your place again and again.